Making polish sausage is easy provided you've read my guide how to make homemade sausage. Making Polish sausage is different to regular fresh sausage in that the meat is cured. This process can occur using fresh meat and curing powder as the sausage is made or the sausage by itself be made from cured meats. In the case of the former I'll list Prague Powder #1 in the list of ingredients. It's not difficult to make, you can make a batch up and store it in an airtight container and purpose of making Prague Powder #1 is that it allows you to add sodium nitrate (saltpetre) in a consistent and controlled manner. Making Polish sausage usually (but not exclusively) involves either hot smoking or cold smoking which you can learn about elsewhere on my site. 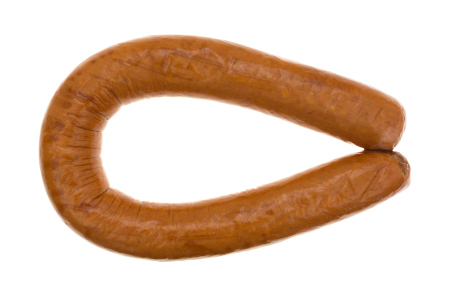 This sausage has it's origins in Krakow, a beautiful city in the South of Poland. If you haven't been, it's well worth a visit, it's most famous son being Karol Józef Wojtyła - Pope John Paul II. This is a sausage is made from chunks of pork that are cured in the skin, frankly there's little emulsification required and truthfully the only reason it's called a sausage is that it is stuffed in a casing. In essence, you're taking little cubes of pork and curing them to make little cubes of ham. It's also fair to say that you won't need to use the stuffer, fill the casing by hand. Traditionally the casing is fibrous ie. inedible. To prepare a fibrous casing, soak it in warm water for 30 minutes. Whilst the preparation and stuffing can be done on day one, this homemade polish sausage recipe will take 3 days to complete. Mix all the seasonings together in a large mixing bowl and place it in the refrigerator for a couple of hours until well chilled. Chop your pork into a half inch dice (the smaller the better) and when done add the chunks to the chilled seasoning. Stir well to ensure that all the chunks of pork are well coated. Use a wide necked funnel to stuff the mix into the casings and tie the ends with butchers twine. Now refrigerate for a minimum of 48 hours. When your 48 hours is up you're ready to cook. 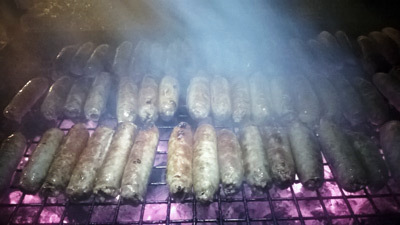 There is an option at this time to smoke the sausage but I think that there are natural casings in my other recipes for making Polish sausage that are better suited to smoking so I prefer simply to poach my Krakowska. The literal translation of the Italian "panini" is "sandwiches", well guess what?.. 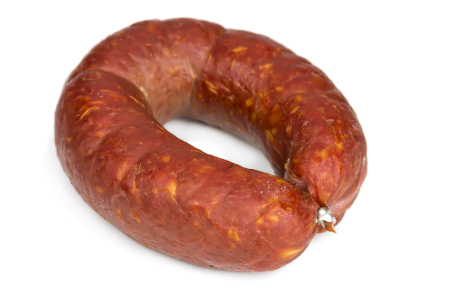 The literal translation of the Polish "kielbasa" is "sausage". To that end I have to say that my recipe is pretty generic, there are loads of sausages sold around the world that masquerade under the title kielbasa. There's also one fundamental to a good looking kielbasa - it's a long link and generally tied (with butchers twine) in a ring. It's not necessary to make links. Kielbasa is traditionally stuffed in a hog casing and you'll need approximately 2m (7ft) of casing for the 1Kg of meat that I have set out in the ingredients. Prepare your hog casings as described in my article making homemade sausage. Make a rough dice out of the pork but and run the cubes of pork through your grinder using a 4mm plate. When done, place the ground meat back in the refrigerator. Now mix up all the other ingredients to make a viscous liquid. Remember that getting the salt to dissolve in the liquid prior to adding it to the meat is important for the emulsification process. Mix the seasoning into the ground pork thoroughly and then run it through the grinder for a second time on the same 4mm plate. Stuff into the hog casings. Tie into rings and refrigerate (hanging if possible) for 24 hours before cold smoking. To cook you can poach or steam if you prefer but inevitably you'll lose a little of the smoky flavour so I prefer to cook indirectly on my kamado. 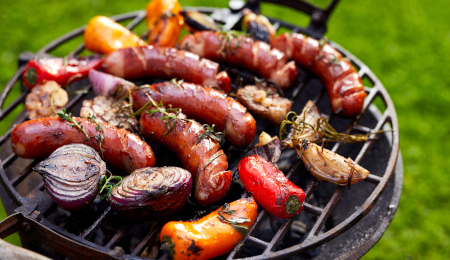 As you start making Polish sausage with my recipes you'll see some common threads in terms of the ingredients used. This sausage still features a lot of those classic ingredients with the addition of thyme and mace. Roughly cut the pork shoulder up with a sharp knife and then pass through the grinder using a 4mm plate. Place the ground meat back in the refrigerator while you make the seasoning mix. Mix all the seasonings well in the water and make sure that the salt has dissolved. Mix well for at least 5 minutes (it should be like kneading dough) and then pass it through the grinder for a second time on the same 4mm plate. Stuff into hog casings and make traditional links. Refrigerate overnight and then you're ready to grill directly over the coals.